Manley's Force provides four channels of vaccum tube microphone preamlifiers found originally in Manley's popular Core channel strip. The Force sits in a hand-crafted all metal chassis purpose built in California. Each of the four channels features 48V phantom power, 120Hz high pass filter, phase invert, selectable GAIN and 7-segment LED peak metering. Force offers outstanding value with four channels of authentic High Voltage Vaccum Tube Mic Pres and can grace any studio in the world. 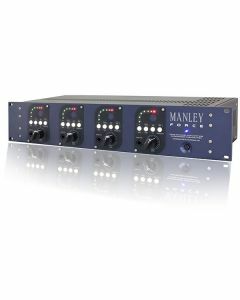 Manley's Force offers four channels of vacuum tube microphone preamplifiers whose lineage can be traced back to Manley's popular Core channel strip. The Force is housed in a hand-crafted all metal chassis. Each of the four channels provides 48V phantom power, 120Hz high pass filter, phase invert, selectable gain and seven-segment LED peak metering. The Force provides unbelievable value with four channels of authentic High Voltage Vacuum Tube Mic Pres, it can and does sit comfortably in any professional recording environment. The Force finds its foundation firmly rooted in the company’s proprietary Core circuitry. These components were originally crafted for high headroom, extended frequency response and low noise. Sitting in a two-rackspace chassis every channel provides a front panel DI on top of a mic input with a hand-wound Manley Iron transformer. Each channel has individual controls for high/low gain, 48VDC phantom, 120Hz HPF, polarity, seven-segment LED meter and a conductive plastic pot for level control. The rear panel’s XLR audio I/O connectors are gold-plated, as are the ¼” DI jacks. The Force separates itself from the rest of the pack by being the only four-channel mic pre positioning itself central to the price median that also commits its design to tube amplification without AD conversion or AD conversion. The ability to internally adjust the gain setting is indispensable for use with ribbons or low-output dynamic and the DIs are more than a marketer’s addition. Considering these factors as well as the preamps exceptional build quality, beautiful style and simplicity of use and Manley has another industry-leading product.